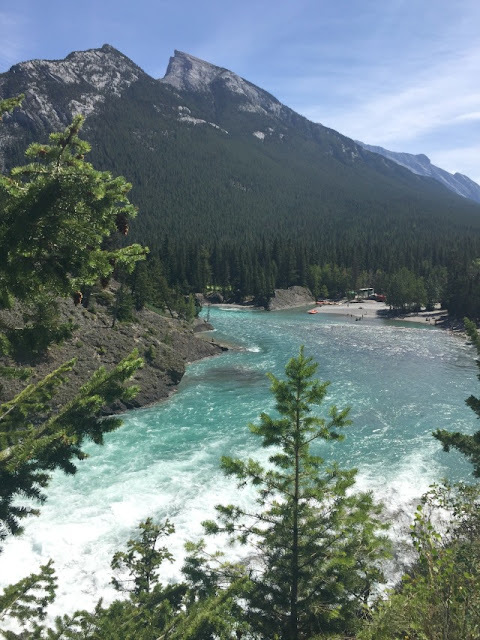 If you've never seen the Canadian Rockies, you must put it on your bucket list! Here you will find some of the most beautiful landscape in the world. People come from all over the globe, every season of the year- to explore and enjoy this wilderness paradise. 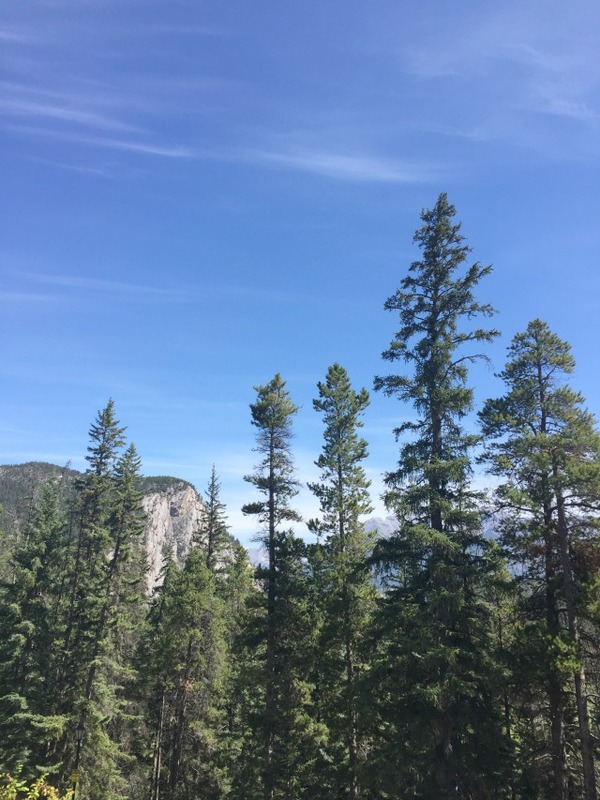 All the elements of heaven surround Banff National Park in Alberta. I was born just a few hours from here in Medicine Hat. I was raised in Vancouver, and have drove through here many times. This time I was able to stop and look around more. This is by far some of the most stunning scenery I have ever seen in my life! Unfortunately with all the excitement of visiting the park and seeing my mother - I forgot my DLSR camera and had to settle for iPhone shots. This vast wonderland is Canada's oldest national park, it was established in 1885. The park is located 110 km west of Calgary. Included in the 6600 square km of mountainous terrain are: several glaciers, ice fields, forest, and alpine landscapes. The Ice fields stretch from Lake Louise, and on to Jasper National Park . Bow Falls doesn't look like most waterfalls, they are short and wide. 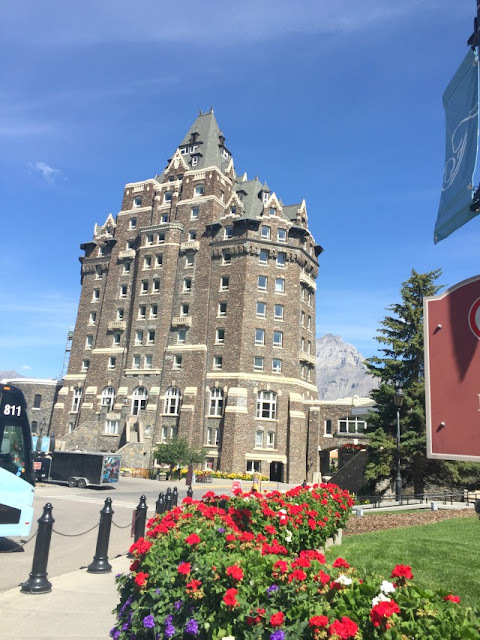 This is one of the more popular attractions in Banff. It's amazing to view the valley that was eroded by glaciers and by the river over the years. There is also a trail you can access by climbing a few flight of stairs. It wraps around the back of the falls. 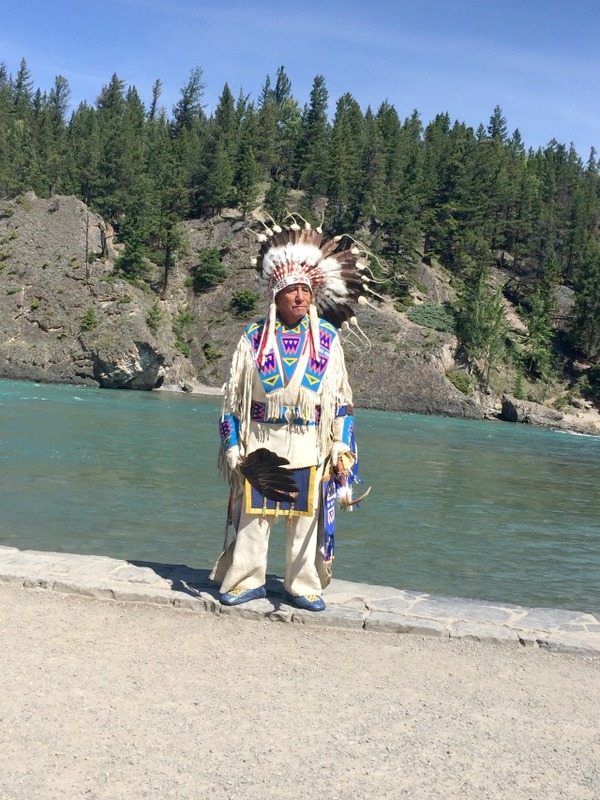 You can also enter it from the town of Banff, along the south side of the river. Hopefully you will wear better shoes than I did. I was in fashionista mode and forgot the tennis shoes...or I should say "runners", all the Canadian lingo is resurfacing! I thought the weather here might be on the cool side, but it was actually quite warm. I also was surprised to see the snow was completely gone off the mountains. The water here is like glass and the color is such a gorgeous turquoise blue. It reminded me of the beautiful waters of Hawaii. 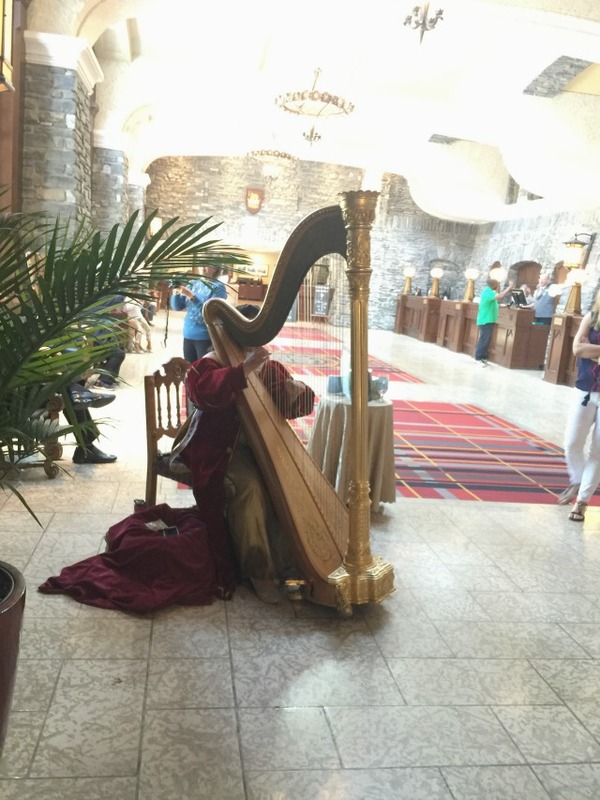 The Banff Springs Hotel is a like an old world castle. 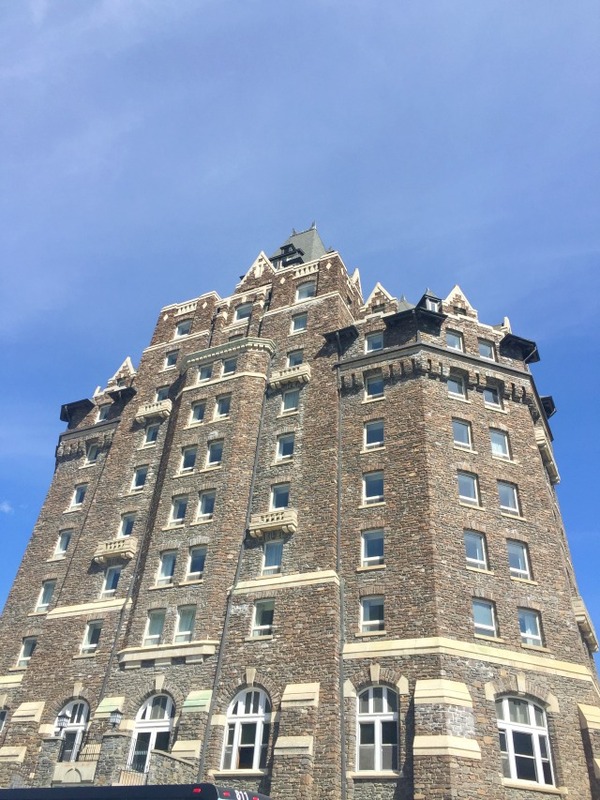 It is a luxury hotel and is considered one of Canada's grand railway hotels from the 19th century. This grand estate is operated by Fairmont hotels and resorts. It was so neat to look all around the grounds and inside, everything is so ornate and beautiful. If you want to reserve accommodations here, 6 months out is best. It's not far to get to Tunnel Mountain road from Bow Falls. There are two different view points and several hiking trails up this way as well. The mountain is pretty much surrounded by the entire grounds of the Banff Springs Hotel and the town of Banff. It's a short drive up the hill from the falls, to get these views. Just about the time we arrived on higher ground , it clouded over and started to drizzle, which did not make good conditions for getting pictures. Nonetheless, the view from up high was breathtaking. 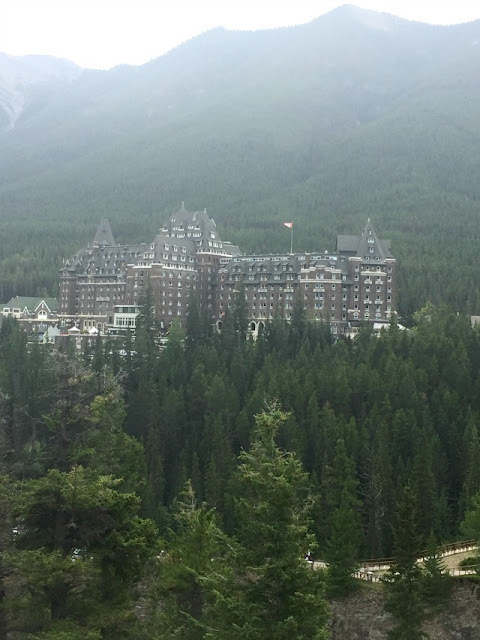 On a clear day you can get an unobstructed view of the back of the Banff Springs Hotel and Sulphur Mountain. There is a Gondola Ride you can take up this mountain, and hot springs to enjoy at the base of the hiking trail. Summer days are warm, with cool evenings. 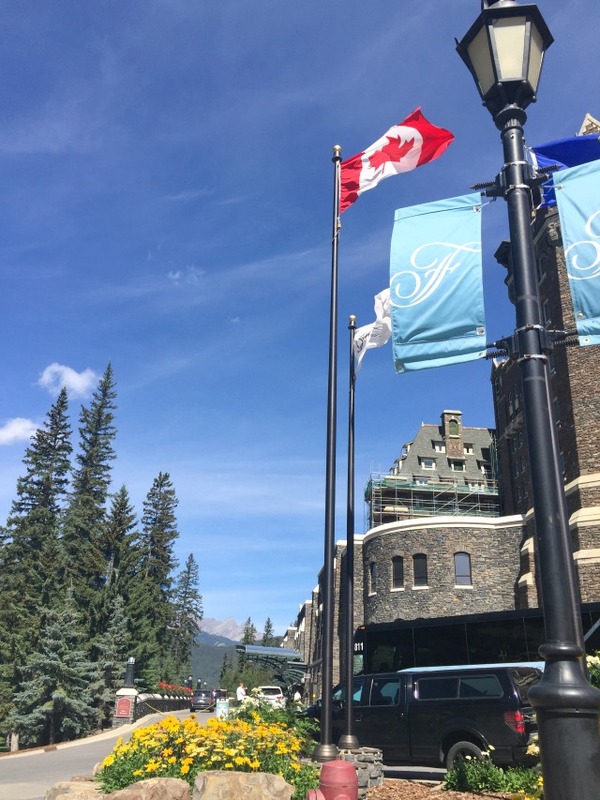 Banff also enjoys extended daylight hours. Banff of course has a much longer winter season than summer. It is a totally amazing place to enjoy every winter sport. Although the temperatures are mostly below freezing, on occasion a warming trend called a "chinook"- helps relieve the cold and brings more snow. Also available are community classes, arts and culture activities, and events for youth. 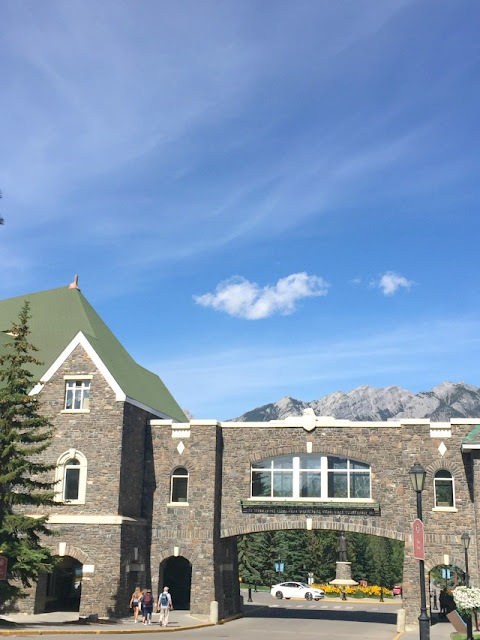 The Banff Arts Center for Arts is a place which inspire artists to make their unique contributions to society. This center is a global leader in arts, culture, and creativity. 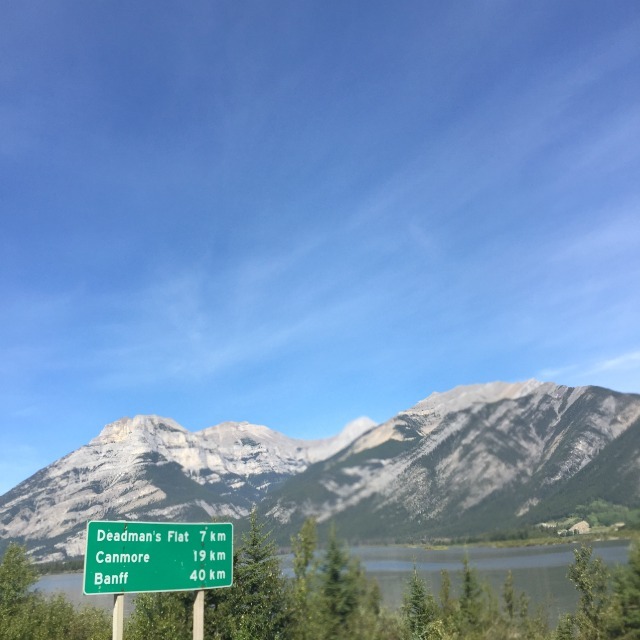 I hope you enjoyed this short photo journey through Banff. There is so much more to see and hopefully you can make it a destination some day soon. I am planning to go back again and do some hiking and camping... as long as there is a cozy cabin: otherwise it will be glamping at the nearest hotel! 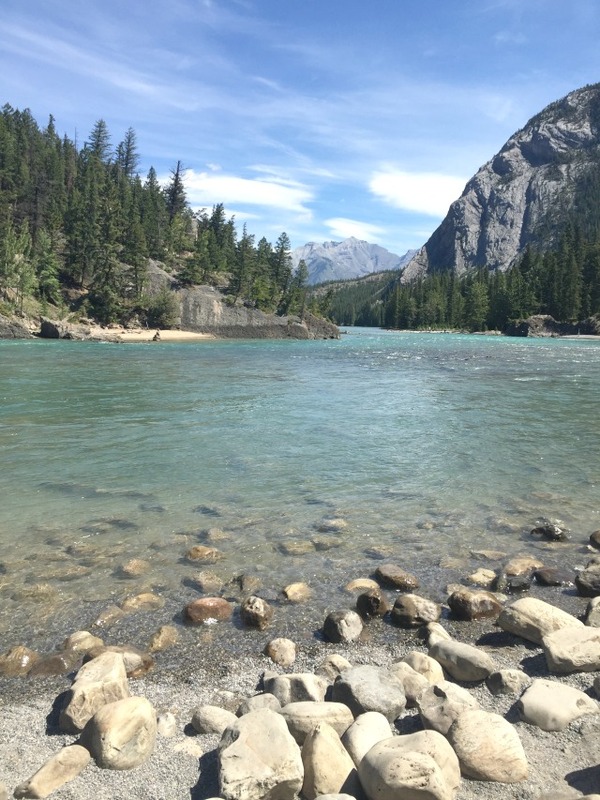 Have you ever been to any of the Parks in the Canadian Rockies? If so, I would love to hear about your experiences in the comments! If you enjoyed this post, please consider pinning the above graphic and share it with your blog or Instagram friends! :) Thank you! *Looking for a travel backpack for your trip to Banff or elsewhere? 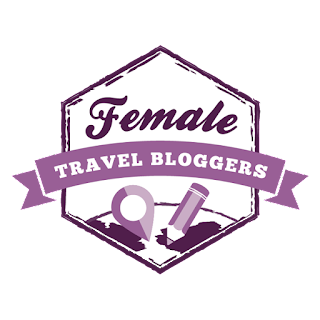 Check out this post, for the best ones for women. I've always wanted to go there after seeing it on the Bachelor a few years ago. Your pictures look absolutely beautiful! Thank you so much Anna, I must have missed that season..bummer! I hope you get to go! How beautiful! I would love to visit one day! HI Ruthie, I sure hope you can! 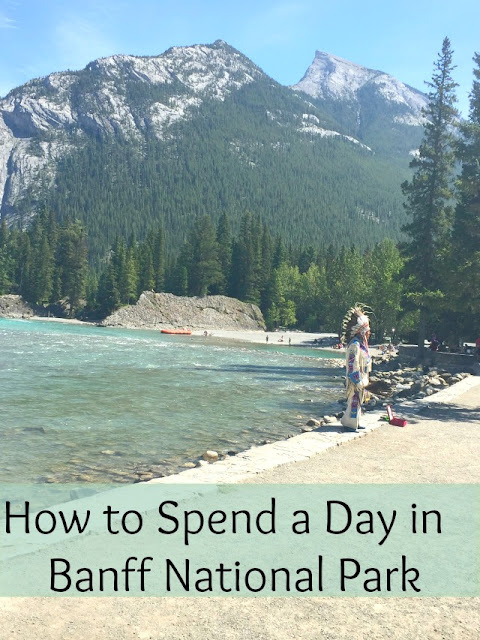 Banff recently made it onto my ultimate bucket list and this was a great post to help me figure out what all I can do there. I pinned it for my future reference, and hopefully that future is soon. Thank you Caitlyn for pinning it, and I sure hope you can make at trip soon! So beautiful and a great reminder that we're so lucky to live in the Pacific Northwest! IT is great to live in the Northwest ...everything is so gorgeous! 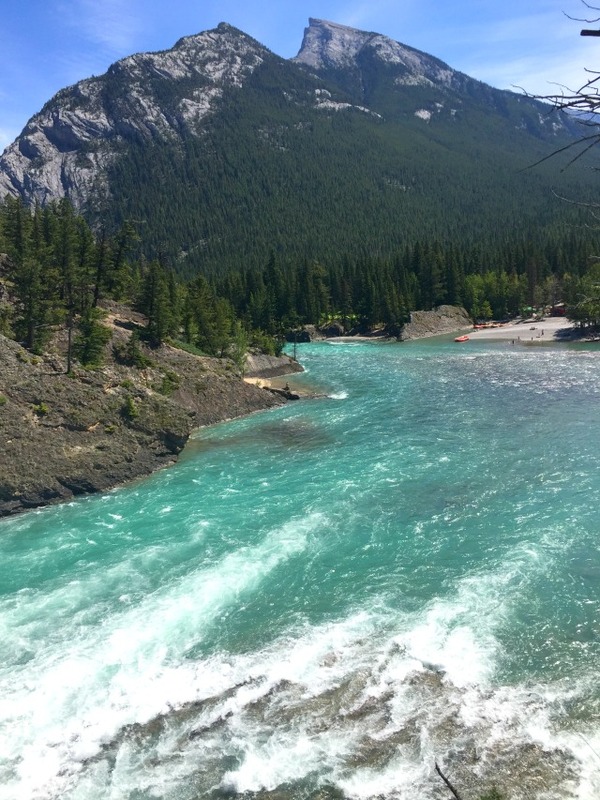 Banff National Park is on my list of places to see for sure! Hi Jill..I think this a must see for a lot of people, I just cant believe I never stopped all the times I went thru before! That water is beautiful! I saw something about this park posted a few months ago and added it to my wish list then - I want to to go even more now! Thank you Lauren for stopping , glad this inspired you farther....have a great night and get yourself on a trip there! Just stunning landscape - Do the natives still live out there? Alberta is awesome. Thank you...yes it is! I am not sure if this guy lived near the park or not..he didn't say much..ha ha! I love national parks! Especially since there are things to do all year round at them :) Looks like you had a great visit! Thank you Amanda for coming by..I love national parks too, I have so many more to see...I LOVE anything outdoors ..natural rugged beauty is so refreshing! This is BEAUTIFUL and a totally different landscape than what I am used to living in South Florida. I would love to visit this area one day!!! Thank you Lauren for stopping by, hope you can go someday..I have never been to Florida..I think I would enjoy the change of scenery from the northwest! It Looks absolutely stunning there Val. And I love your red sandals!! Hope you and your sweet face are happy and doing well!! Awe Andrea.. you are such a doll, hope to meet you in person someday! Thank you for the kind comments..I am missing the link ups, haven't been able to get style pics lately, but hoping to next week! xoxoxo HOpe you are well! What a beauty! Banff is already up there on my travel list but these photos sealed the deal. Those turquiose rivers and lakes are stunning! I know right Chelsea??! the color of the water is so stunning...I thought I died and went to heaven...it was that amazing! What a beautiful place! My husband and I just added this to our bucket list! Great Abby, glad you liked the post and hope you can go soon! I love all these photos! 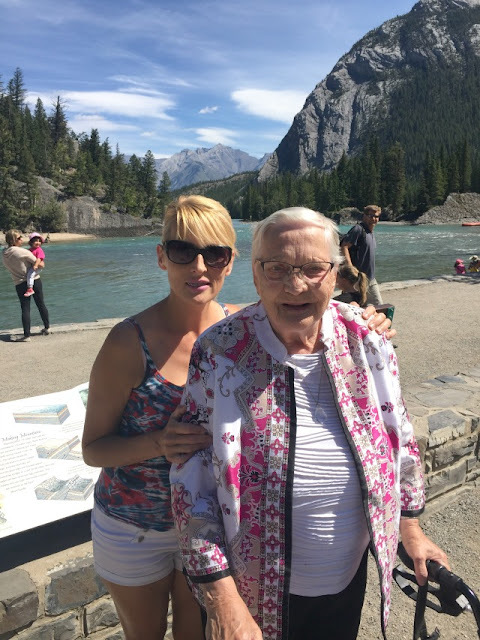 Banff and Lake Louise are on our family travel bucketlist for sure! Thank you Lavonne for stopping by, you will LOVE it! Oh my goodness, the scenery is gorgeous! Even without your DSLR, you captured such beautiful photos. Awe thank you Katrina that made me feel better, I was thinking they didn't look so great..well its mostly the last few cuz it was overcast when I got up there! Wow! This place wooks stunning! I will have to add this to my bucket list. Thanks for stopping by Christine I hope you get to go! Wow how cool Susannah that you got to camp there, I would LOOOVE to hope to soon! So amazing! My husband has been and tells me we need to go. I definitely need to do some planning. Love your pix and overviews! Thank you so much Patricia, yes you DO need to go..you will be in awe! How lovely! This is on my bucket list, and now I want to go there much sooner! Thank you so much, glad it inspired you to get there asap! 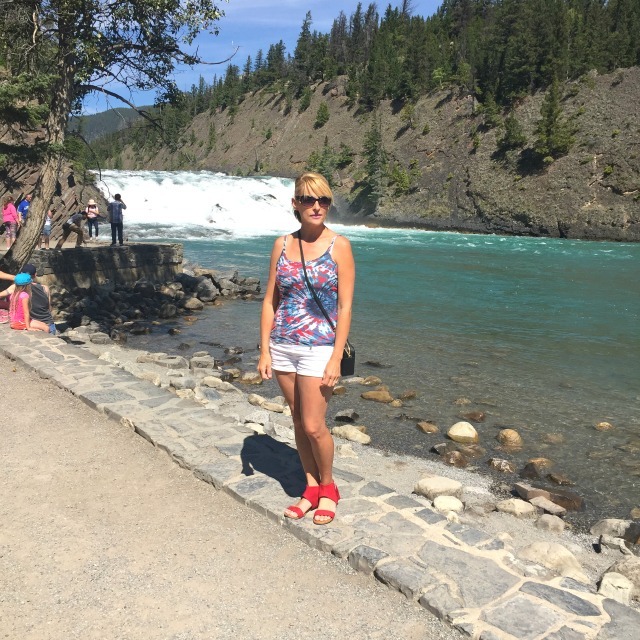 I love Banff! I need to return with my kiddos! Cool that you've been..yes your kids would love it too..
Wow... such a gorgeous place to visit. Thanks for stopping Amber it is amazing! Thanks Jessica for saving it....Hope you can use the tips some day!! Omg this has been on my list forEVER! Great post! Pinning it for when I finally make it there. Thank you so much Christie, I hope you do make it there..it is worth all your time and money for sure!! Looks like an amazing day! Sadly, my one and only trip to Canada was devoid of outdoors activities, as it was a business trip. I'd like to explore more next time. Thank you MIss Angie, missing you! I was at Lake Louise years ago ..just passed by I missed out on all these jewels as a kid! Your pictures are amazing and the views are breathtaking! I'd absolutely love to visit and will pin this post so I can look back on it later! Thanks! Thank you so much Suzannah for the kind words, I am glad you enjoyed it! I hope you get to go someday soon! Awesome post! I can't wait to explore Banff when I move to Canada. Such beautiful photos! Brought back so many memories! thank you so much for stopping by! Where are you moving to? I miss Canada a lot , sometimes think about moving back!! 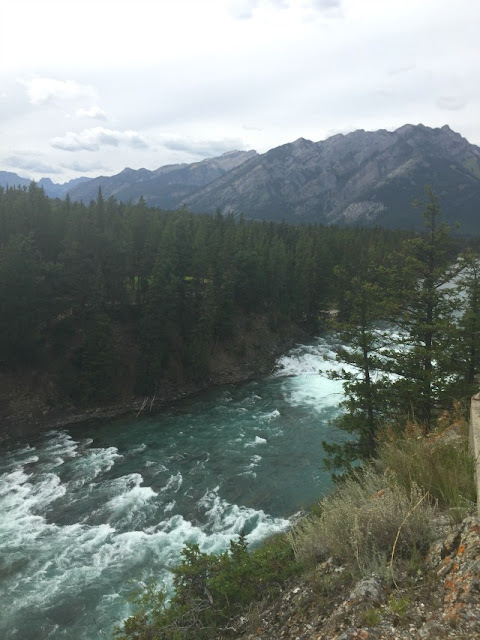 Banff has been on my list for so long. Canada has so may national parks that i want to explore! Amazing photographs! Hi Nafisah, yes I want to see the other ones as well! Thank you and glad you stopped by! Hey Laura, thank you and I'm glad it gave you some inspiration to go check it out, have a great day! Thanks for sharing, Valerie. Reminds me how an appreciation of the natural environment that surrounds us contributes to our health and well-being. Hey Dominic, thanks for stopping by again, hope you are doing great! 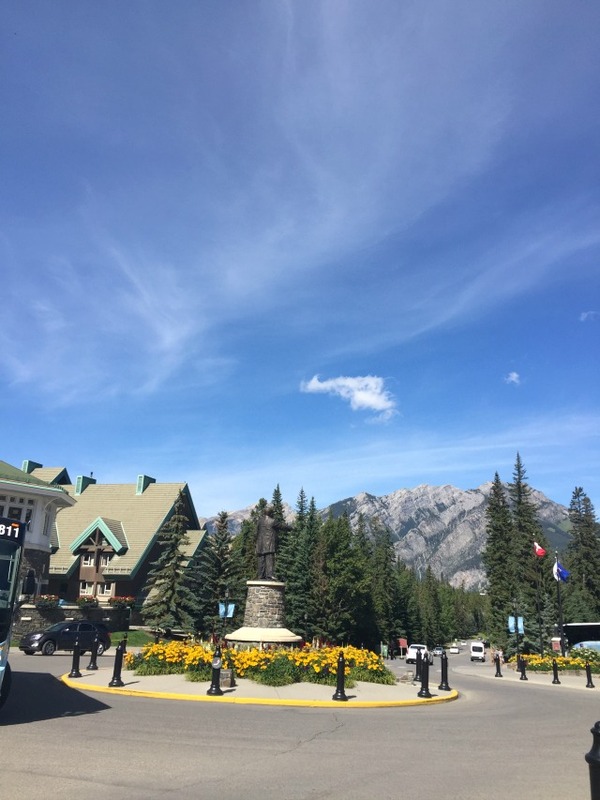 Banff is one of most favourite places in the world because it's just so relaxing and serene! My favourite activities are High Tea at the Banff Spring Hotel, hiking Sulphur mountain, and having coffee at one at the Wild Flour Cafe with the beautiful view of the mountains. I didn't know about High Tea and the wild flour café..thanks for sharing! I will check out those next time! So gorgeous- I want to see this in person! Thanks for sharing! What a beautiful place! And that hotel, wow! So cool! Hi Jenn..yes the hotel was amazing...I hope to stay there next time! Banff National Park is on my list of places I want to be able to visit. It looks like there is a lot to do there - and for everyone (even for those who are not really into sport due to medical reasons). The landscape is amazing! 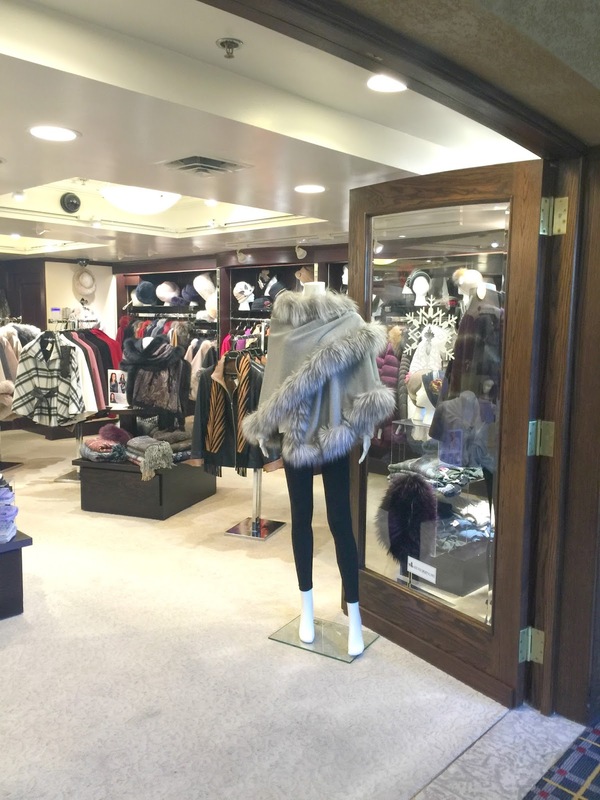 Hi Lori, yes the options are endless for any age! Thanks for stopping by! 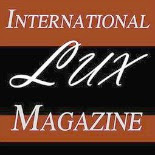 Thank you, hope you can check it out...its such a scenic place! Hi Julie. thanks for stopping by..thats what I heard..but then my cousin said if you book 3 mos before the busy season (winter and summer) it should be good! Wow!! Your photos were nice and this place is beautiful!! I had not heard of it but now definitely on my list. I know you left your camera at home but your photos were awesome. HI Wilma! Thank you so much for the kind comment and for stopping by! I hope you can make it there, its unbelievable!